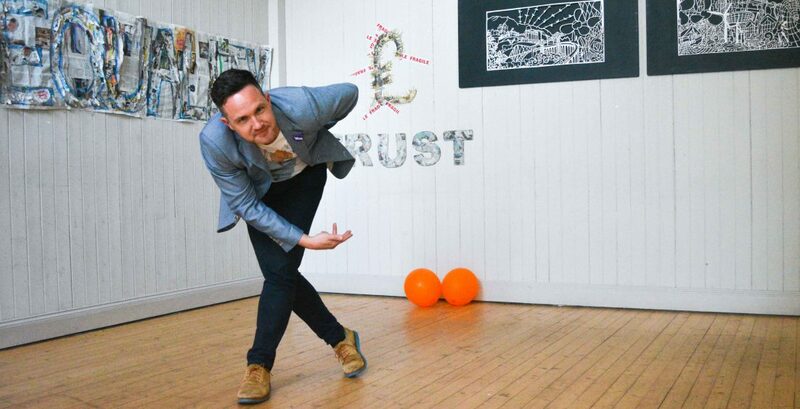 Alan Bissett’s writing deals in unlikely combinations: racy young blokes in touch with their feminine sides, Scottish culture wedded to Americana, socialism married to commercialised popular culture, genre fiction matched with formal experimentation. So, I’m going to avoid ‘Bissett meets Welsh’ to briefly pursue a more intriguing if unlikely and neglected crossover: Bissett meets Brett Easton Ellis, the US author of, among other things, American Psycho (1991) and a key influence on the young writer from Falkirk. Boyracers (2001) is Alan Bissett’s first novel. Set in the provincial, reluctantly post-industrial setting of Falkirk, we could not be further away from the sophisticated, globalised, service-oriented culture of contemporary Manhattan in American Psycho. What both novels share, however, is a certain culture of vanity, an insane obsession with surfaces, an unhealthy preoccupation with bodies, along with an insatiable intertextuality. In both Boyracers and American Psycho almost every sentence drips with cultural references to the 1980s. Veering structurally between stream of consciousness and schizophrenia, both texts tune into and out of the different and often disjunctive narratives that comprise their local/global environs. Fittingly, both novels open in music-saturated vehicles, and both close with references to public signs (in American Psycho ‘This is not an Exit’; in Boyracers, ‘YOU ARE NOW LEAVING FALKIRK’) that point to an exterior world beyond the text, but which also gesture to the text itself as a claustrophobic container that neither protagonist nor reader can entirely leave behind. However, to limit Boyracers to its connections with Ellis’s contemporary classic is ultimately to do a disservice to Bissett. Where Ellis serves up tried and tested dramatic subjects (albeit in powerfully new guises) that are well disposed to dramatic fiction (serial killing, glamour, wealth and power), Bissett takes significantly greater risks in adopting what in different hands might seemsimply trivial, untrendy, parochial subjects (peach schnapps, irn bru, Falkirk) and submitting them to his own infectious energy and youthful, unremitting humour. Bissett’s second novel, The Incredible Adam Spark (2005), pursues some of the cartoonish qualities already witnessed in the bold, primary colours of Boyracers, extending them to their logical conclusion. Its basic storyline borrows from the world of comic book superheroes as Adam, following a blow to the head, begins to believe he is in possession of special powers. As with Boyracers, the adrenaline-fuelled, Falkirk-inflected prose seems to perform a sort of stylised attention deficit as it jumps hyperactively from subject to subject. Also like Boyracers, The Incredible Adam Spark has a music junky for a protagonist: Adam Spark is hooked on Queen, he works in a fast food joint, and hangs out with his mates. The only difference is that, unlike Alvin in Boyracers, these are no real mates and Sparky is more a figure of fun, exploited, used and abused by those around him. Eighteen going on eight, the protagonist suffers from learning difficulties, and is effectively abandoned by his parents. Adam seems only truly loved by his older sister Jude, and even she is increasingly distracted as she settles into a new life at university. The Incredible Adam Spark has an edge of tragedy about it that is missing from the more friendly, boyish flippancy of Boyracers. Favourably compared with Mark Haddon’s The Curious Incident of the Dog in the Night-Time and with Forrest Gump, the novel was described in The Big Issue as ‘Bizarre, hilarious and moving’. Some of Bissett’s most recent work in the theatre expounds these values, notably his so-called one-woman show, The Moira Monologues, which was authored by Bissett and successfully performed across Central Scotland. Bissett’s dramatic work has flourished in recent years with his short play The Ching Room in 2009 and his award-winning short film, The Shutdown, in the same year. In Bissett’s words, The Shutdown is ‘about the eerie presence of the huge Grangemouth petro-chemical refinery in Falkland and a terrible industrial accident which nearly killed my father in 1987.’ Bissett is also an occasional song writer (‘The Rebel on His Own Tonight’), budding literary critic (‘The New Weegies’) and talented editor (Damage Land: New Scottish Gothic Fiction, 2001). Most recently Bissett co-edited In the Event of Fire (2009), issue 27 of Scotland’s leading forum for contemporary literature, New Writing Scotland. His seemingly effortless negotiation of the boundaries between the genres of the Marvel comic and academic criticism help to explain Bissett’s ability to see both sides in the recent debate sparked by James Kelman’s controversial remarks on popular fiction (See The Guardian, 31 August 2009). More crucially, it exemplifies what is by turns most original, unflinching, and unpretentious about Bissett’s fictional output to date.